It's one of those days spent mainly work and you need something to set the tone for the next few hours and give you a much needed boost. Or, maybe it's simply that a pampering session is in order. Either way what's required is something that will help wash away any fatigue and ignite some energy while relaxing and soothing the body. I have just the thing! Things in fact! Anyone who knows me, knows I just love soaps and shower gels, which I guess you're thinking is useful as we all need to wash! But what I mean is, I have an obsession with gorgeously scented bathroom lavables. You can often find me holding soap up to my nose on the verge of devouring it... but that's another story. My ultimate favourite bar at the moment is La Florentina's Rosa Selvatica . If you can call it a bar. It is horrendous in proportion, which I love. With every rub of Selvatica the fairytale-like aroma of rose petals sweetened further with ripe strawberries and blended with thick cream overtakes your senses. The warmth of the fragrance mimics the soothing sensation of the lather on your skin. This is definitely reminiscent of a traditional Italian castle. 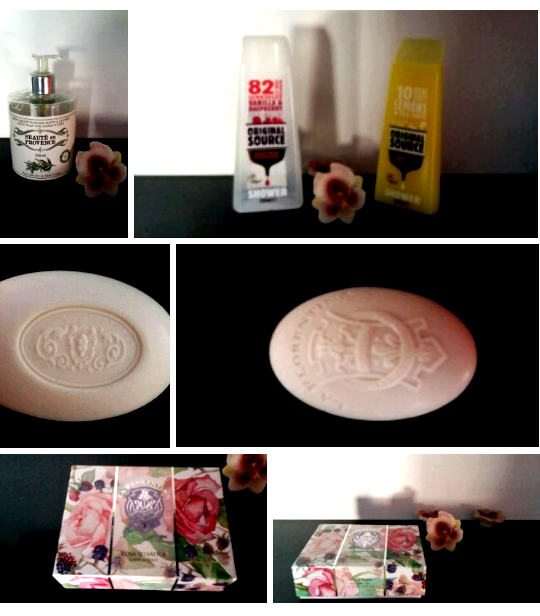 Luxurious the soap is even embossed on both sides with the brand logo. Two are packaged in one pretty box - perfect for gifting. But if you're after something more of this age, the vegan Original Source shower range is unquestionably the better option. There is something about natural ingredients on the body that seems just right. These gels are more food for the skin than anything else. The extensive range includes green banana and coconut, vanilla and raspberry and lemons and tea tree to name a few. I warn: do not attempt to drink, however tempting!! However, do absorb the rich fragrances with senses as if heightened in a dream. Exit your shower smelling like your favourite sweet, creamy or fruity medalies. By the way, did I mention, how sleek and modern the packaging is? And how bright and colourful the gels are? If you're into something natural, but highly moisturising go for the Beauté en Provence liquid soap. What can I say, this gel could just be a liquidised olives, it's scent is so beautifully rich; the olives may as well have been picked off the trees the same morning it smells so fresh! Sometimes you know instantly what will do wonders for your body and this is one of them. It's not too oily or too lathery, but you can easily control how much you use via the pump. It instantly lifts your mood with a light, summery fragrance and caressing qualities. If you're like me you won't be able to choose one but use them all. We have to spoil ourselves sometimes, right?